The other day my son Jimmy broke this 30-inch polished chrome towel bar that had been holding up towels in our master bathroom for the last seven years. This was not a big deal, but it meant that I had to go out and find another towel bar to replace it. The big issue with any task like this is that I have never looked that deeply into the inventory of the Ace Hardware or Newtown Hardware House, so I don't know if you can replace the towel bar without completely replacing the fixture. I'll be back here again when I need something that they do stock. I'm probably better off at The Home Depot if I want to get this exact item. What was interesting about the trip to The Home Depot was that they had 30-inch polished chrome towel bars for $5 or $6. But I found the same considerate sales help in the store that I found at the Ace. The guy who was ringing up my purchase said, "You know, you might want to look in lumber to see if there are any dowels that would fit inside this towel bar. 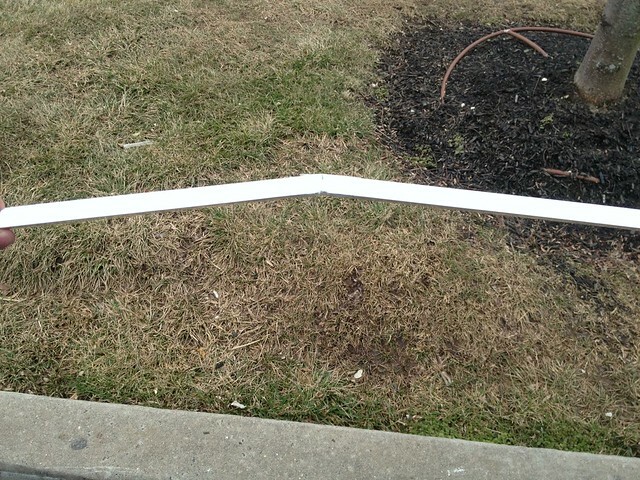 This way it wouldn't break in half as easily if one of your sons leaned on it by mistake." This made great sense. So I went back into lumber, found someone who looked at the towel bar, and said, "Yea, we have dowels that will fit inside this bar. I think they cost about $1." I got myself a 1/2" x 36" wooden dowel. I brought both pieces home. The big technical issue was that I had to cut six inches off the dowel in order to make the dowel fit completely inside the towel bar. This was easily done, but it meant finding a saw in the shed out in the backyard, and cutting the dowel down the way we would cut an old wooden hockey stick. It's a story about my family that Jimmy was excited for me to tell on one of our websites. I needed a way to test SuperAssets for Flickr, a new plugin that my company After6 Services created for Movable Type 5, with a theme that is included with Movable Type. If you look back at the top of this story on its page, the photo has a link underneath it that reads "View on Flickr". Following this link, or clicking on the photo itself shows you the photo page on Flickr that represents this photo. That's the heart of the SuperAssets for Flickr functionality. I'm finishing up a screencast about SuperAssets for Flickr, which will probably be posted on After6Services.com next week. This screencast will demonstrate how to use the plugin and more clearly illustrate its benefits.